Iceland - the land of ice and fire - never disappoints, but especially not when it comes to hiking and trekking! Whether you're wandering wherever the wind takes you, or sticking to a trail like Laugavegur, Iceland is a dream come true. "The Iceland Hiking was a phenomenal trip! It was challenging but the trip leaders..."
"Really enjoyed this hiking tour, the views were amazing with a wonderful variation..."
"This tour was great! 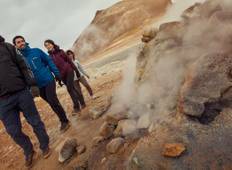 Our guide John Hoo was very nice, always helping and a great..."
"The views were amazing, right from the dock in Isafjordur to the dropoff in Horn,..."
Bathe in naturally occurring hot springs pools in the spectacular geothermal zone of Reykjadalur Valley. Watch the awe inspiring spectacle of the Northern Lights at Hella. Enjoy a fun day hiking the Solheimagokull Glacier on Iceland’s southern coast and take in the stunning scenery of rugged rock formations and gorgeous ice sculptures. Drive the scenic route from Skaftafell to the Virkisjokull Glacier and be enthralled by its continuously evolving state. Explore the beautifully contrasting wonders of the Vatnajokull National Park. Hike past moss covered volcanic landscapes to reach icy blue glacial masses. End the journey with a memorable cruise along the Jokulsarlon Glacier Lagoon. Follow a varied, multi day Icelandic hiking trail through the amazing volcanic lava fields of Laki all the way to the spectacular fjords of the world renowned Skaftafell National Park. 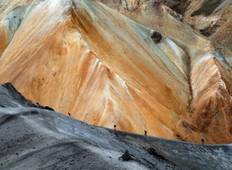 Embark on a journey on the Laugavegur hiking trail between the deserted volcanic highlands of Landmannalaugar to the glacial valley of Porsmork. Be surrounded by rhyolite streaked hills, black sand deserts, roaring hot springs, flowing rivers and massive icy masses. Snowshoe and hitch a ride in a jeep to reach remote winter landscapes and dazzle at the sight of frozen waterfalls at the Thingvellir National Park. Come equipped with fully charged electronic devices and extra sets of batteries for flashlights and headlamps as the weather conditions in Iceland can be quite severe. Dress in warm layers and consider using thermal underwear for extended outdoor activities. Carry a compass, GPS and a map even on guided tours as the weather can get quite foggy and you don’t want to lose your way on a trail. Wear waterproof, lightweight and durable hiking boots for trekking across rough terrain and carry extra pairs of socks. Collect trash and dispose it only in the specially designated waste disposal containers. Lava fields may contain cavities covered up by mossy overgrowth, so stick to the designated trail to avoid injury. Don’t stand close to the edges of hot springs. The ground is often loose and it is easy to fall. Always test equipment (such as tents) before you take them outside. "Excellent small group hiking through beautiful fjords and mountains, with the bonus..."